Enjoy easy reading anywhere, even in the sun. 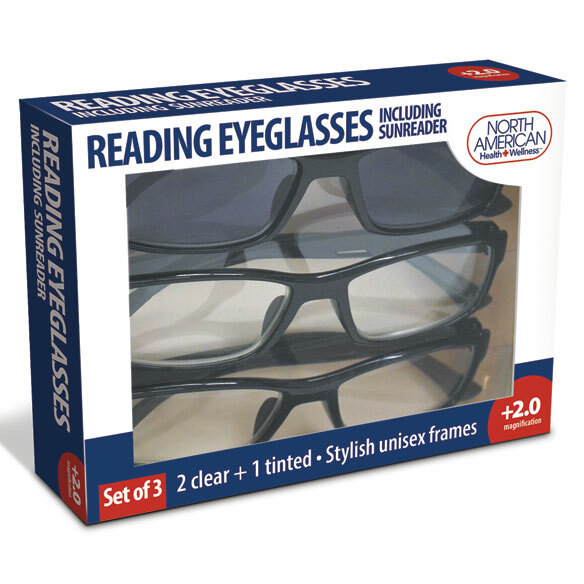 Value reading glasses with sunreader set includes 2 pairs of regular readers and a pair of sun readers — they look like regular sunglasses but magnify for comfortable reading outdoors with less eye strain. Perfect for home, auto, pocket or purse. Classic frames look great on men and women. 7 magnifications: +1.50, +2.00, +2.50, +3.00, +4.00, +5.00, +6.00. I bought these for my dad and they are just perfect-it helps him to read with ease and not have to strain his eyes. 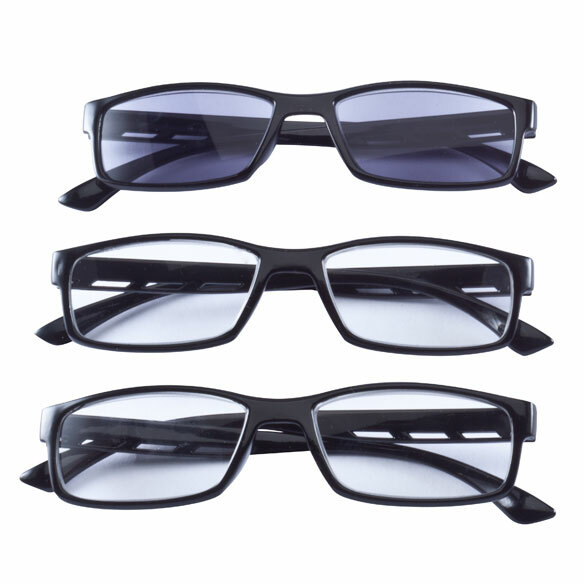 Great product with wide variety of strengths and comes with a tinted pair. Love it! Good price for readers that hold up well but aren't insanely expensive. So reasonable, in fact, I got this set to have a pair of dark readers and clear readers I could leave in the car....leaving me an extra pair to pack in my carry-on for travel! The glasses I received does the job. However, one pair is already on its last leg. The cheap plastic is now uneven when I put them on! Because the sunglasses I have are too dark on cloudy days but bright snow. My 95 year old mother has macular degeneration & im hoping these glasses will help h er be able to read the newspaper. Price was reasonable as always. My 97 year old aunt (her sister) bought a pair and they seem to help her and she has same problem. Thank you for your catalog. I chose this for the sunglasses component. It's always a pain to have to put regular sunglasses over my glasses. I like the Sunreader part. I'm 103 years old, need I say more! To help me read fine print in both regular light and in sunlight. Cant read without them and I keep breaking or losing them. I love to read outside in the warm months and am looking forward to these. I like having extra pairs around and like that one of them is made for outside in the sun. I WERE COLOR CONTACTS AND STILL NEED EXTRA WHEN I'M NOT WEARING THEM. THEY SEEM LIKE THE BEST CHOICE. The only ones with a tinted pair as well as clear lenses. I've ordered these previously. They are great! Unfortunately I misplaced them (senior moment) & I'm going on vacation in a month and these are nice looking and work well. My husband could use these. I need some magnification while driving but in the sun also need sunglasses, this will do both. how too figure your size? BEST ANSWER: Thank you for your question. We suggest checking with your local eye doctor to see what strength reading glasses will work best for you. We hope this information will be of help to you. Can I order this set in different strengths? BEST ANSWER: Thank you for your question. When purchasing the Reading Glasses with Sunreaders, please click the drop down for select size to select the strength that you would like. We hope this information will be of help to you.